The apartment homes at Mariners Crossing near Crabtree Valley Mall were designed to meet a variety of lifestyles. Whether you're a young professional, raising a family, or enjoying your empty nest, we have a floor plan for you. Our 823 square foot one bedroom apartments are light, bright, and airy. If you want more room to spread out, our two bedroom floor plans fit the bill perfectly. Many also include a full second bathroom. For the ultimate in space, choose one of our three bedroom, two bathroom floor plans. 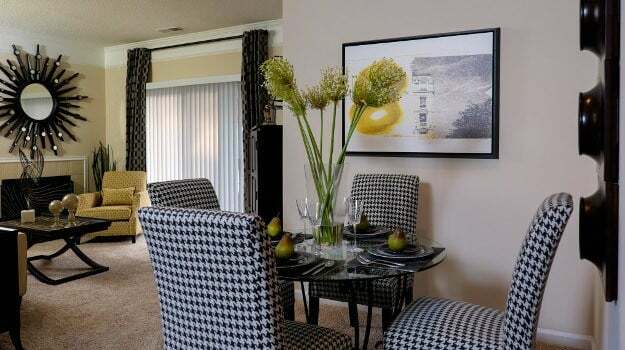 Every apartment includes upscale features such as nine-foot ceilings, updated kitchen, a private balcony or patio, a full-size washer and dryer, and fireplaces in select apartments. Optional touches such as a fireplace, plantation blinds, and faux-wood flooring add even more elegance to your home. Of course, all residents enjoy carte blanche access to all of our high-end community features like our sparkling salt water pool, 24-hour fitness center, and business center. And all of this is just minutes from downtown Raleigh. Visit our neighborhood to see what else is just a short drive from Mariners Crossing. We're ready to envelop you in comfort, luxury, and hospitality. Call today to schedule your private tour.